GALE WARNING: Reigate could see 40mph gusts in exposed places building through Sunday peaking in the afternoon and early evening. Sunday will see the first Autumnal storm bringing rain and strong winds and a cool plunge of air from the Poles through Sunday and influencing our weather for much of next week. Rain is due to arrive Sunday pm, and winds will build through the day to reach peak gusts possibly close to moderate gale force in exposed places 40mph into Sunday evening. Rainfall totals overnight into Monday could amount to 6-10mm, less than the rain yesterday and overnight, but heavy at times. The cool air will be a feature as it follows the cold front with a Polar airmass fresh from Iceland. Expect temps to struggle into low double figures and feel especially cool in the breeze. A gradual recovery through the week but the LOW will never be far away, lingering in the North Sea / Atlantic between Scotland and Norway: bringing northerly winds much of the week. The end of the week might see ex-hurricane Humberto knock on the door. At least he will bring tropical air instead of Polar! Autumn is winding up! 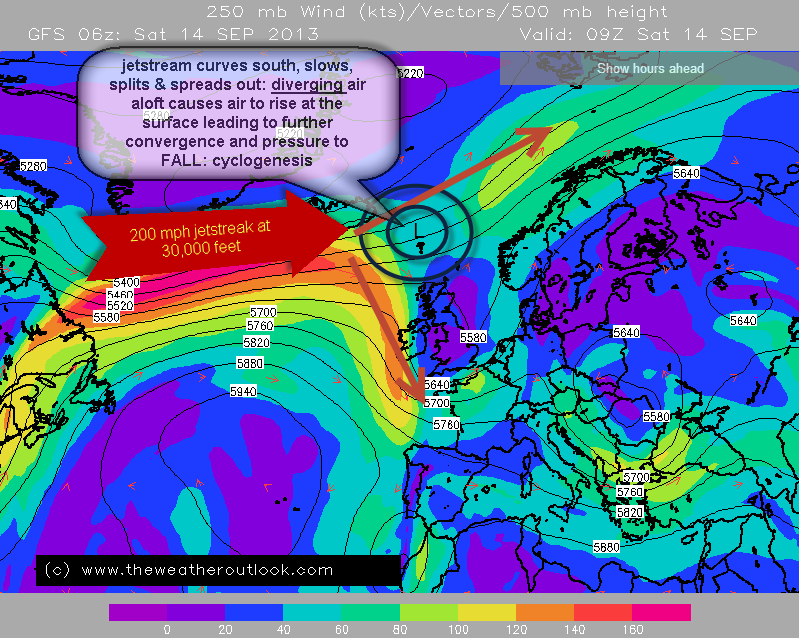 The chart above shows an unusually fast 200mph jetstream at 30,000 feet blasting across the North Atlantic from S Greenland to to S Iceland. This jetstream then loops south and changes speed. Any alterations in the speed and direction of an active jetstream are potential development areas for mid-latitude depressions. The one South of Iceland, developing as we speak, is being created by the sudden decelaration of the polar jetstream and a steep temperature gradient between each side: warm to the south, cold to the north of the jet. This steep temperature and pressure gradient across the jetstream axis encourages rising air (drags it off the ground), a fall in air surface pressure and convergence of airmasses at the surface: a cyclone.